Steam, an awesome and incredibly popular gaming platform and store, has just released its mobile companion for iOS and Android devices. It is now easier than ever to connect with friends, chat, browse and shop games while on the go, freeing users from having to stick near their desktop machines to interact with others. This new release places the entire platform on a whole new level, creating a mobile social network element for the community. 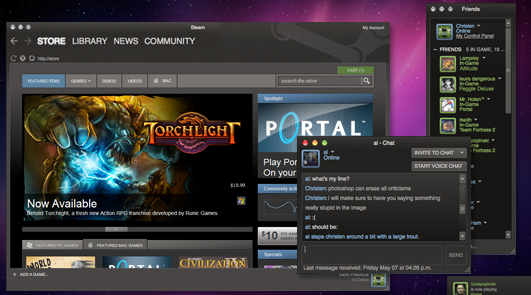 Steam has a killer library of Mac and Windows titles, and caters to a large community of gamers; its competition, such as Origin and Games for Windows are generally viewed as lesser offerings by the various gaming communities. The store is a treasure-house for anyone interested in PC gaming, as it features titles from large houses, as well as indie titles. The Humble Indie Humble, a collection of games released en masse at occasional intervals, uses Steam as a distribution point. We recently covered one of Steam’s featured games, LIMBO, a hauntingly beautiful and unusually structured game that’s definitely worth a look. Gamers unite, you have a new toy.